On any given night there are close to 600,000 people that will be sleeping on the street. although the overall number of people that are without shelter has decreased year over year. However out of that 564,708 people who are considered homeless, 206,286 were people in families, 358,422 were individuals, and a quarter of the entire group were children. The Finding Shelter Program that The SkyPilot Project is organizing is a Program that seeks to build a central database that someone would be able to search and find a homeless shelter. 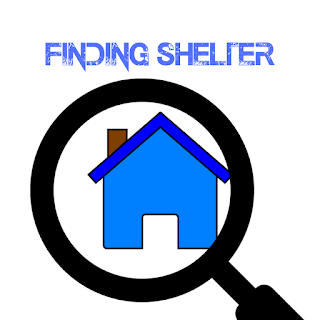 When an Individual does a search they will be able to find a Location, and Contact information, how many beds or rooms are available, if that location offers meals, and if a location is first come, first serve or if a location does a "lottery" for the available beds. The Results would come up on a Google Map so that way a person would be able to get directions so that they could walk, drive, which bus routes they would need to take to get to the location of the Shelter. Also it will be a tap and pay app that will cover the cost of travel that an individual would need to cover, for example if they needed to ride the bus to get to a shelter that had an open spot. 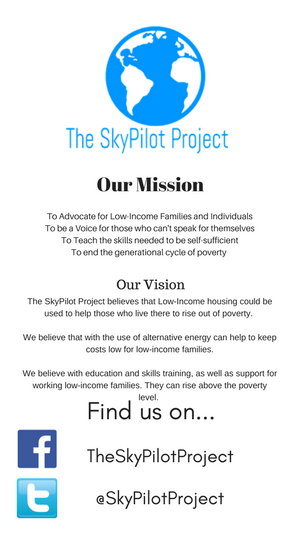 The SkyPilot Project, feels that this a vital need that isn't being met at the current time, and that the issue of homelessness is very much a part of the Primary Mission of The SkyPilot Project. The Homelessness issue is one of the First major issues we will be focusing on with all the limited resources that we currently have available to us. The SkyPilot Project is looking for Website Designers, Website hosting donations, and Individuals that know how to create, build, maintain a cloud based database. This will be a long term program that will need a lot of work from Volunteers to make this happen. It won't be an easy project for us, and it will not be cheap. Cloud storage along will cost anywhere from $1199 to $2400 a year, and that doesn't even cover the cost of coders for the app, or the cost for a website or even the cost of api access to Google Maps. Just the cost of getting the word out will be substantial. So it's estimated that the first year budget would about $15,000 to $20,000 possibly more if costs aren't stable, or if an unexpected cost were to crop up. There would also be a secondary fund that would be established that would handle the money for the tap to pay portion of the app. Which would need to be funded with at least $200,000 a year. So.. The SkyPilot Project is putting out the Call to anyone that would like to Volunteer for this Program. The SkyPilot Project is currently working to get the systems in place to take financial donations. We are not at this time a 501(3)c Non-Profit and it will be sometime before we can become one. However I won't let anything get in the way of the mission that The SkyPilot Project has for helping people. Once we have money coming it, our financials will be completely transparent for everyone to see where every penny is going. We have big plans, and the thing with big plans is that they normally take big money. So over the next several years we plan to raise about 2 million dollars. The way we are going to do that, is with sales of products, fundraisers, and other revenue generating projects that we are currently working on. I hope that this project and the other plans we have have you as excited as we are.